Chief among the misconceptions about Wolf’s Lair, the beautiful Loire-style castle on Durand Drive, is that its name has something to do with wolves; certainly the wolf’s head placard on the front gate implies it. Nevertheless, Wolf’s Lair was named not for the animal but the man who built it: Bud Wolf. Wolf was a real estate developer; he also owned the Texaco station that stood on the site of Beachwood Market’s parking lot. As lord and master of Wolf’s Lair, he also may have been the archetypal early Hollywoodlander: an eccentric bon vivant. When not at home in his splendid turreted mansion with views of Lake Hollywood, the Hollywood Sign and the Observatory, Wolf enjoyed playing golf and driving his gull-wing Mercedes. He had a mistress named Diane. (His wife suffered from mental illness.) 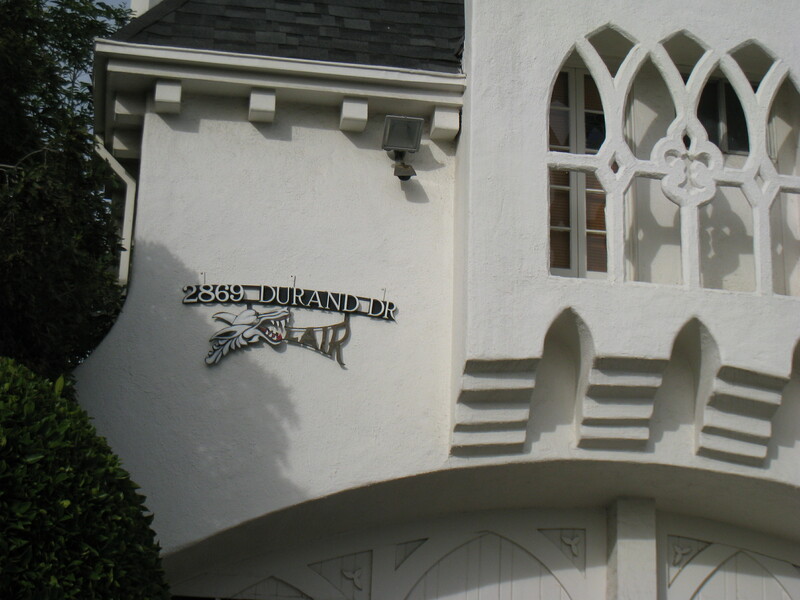 He employed the alcoholic former caretaker of the Hollywoodland Sign as a full-time handyman. He also kept an exotic pet: a gibbon whose howls ricocheted around the canyon. The gibbon lived in a tree during the day; at night he supposedly retired to a room in one of the turrets. Wolf’s Lair is notable not only as a fine example of the French château architecture that was the rage in Hollywood during the 1920’s but as an example of mid-century architecture as well, as Wolf later commissioned a guest house by the architect John Lautner. Although the exterior resembles a plainer version of the main house, its interior is pure Lautner, with wood-beamed ceilings, stone pillars and lots of glass. The guest house is one of three commissions John Lautner designed in Beachwood Canyon, the most famous of which is the glass-fronted addition of Beachwood Market, built in 1952. Wolf’s Lair’s western facade. Lautner’s guest house is at left. 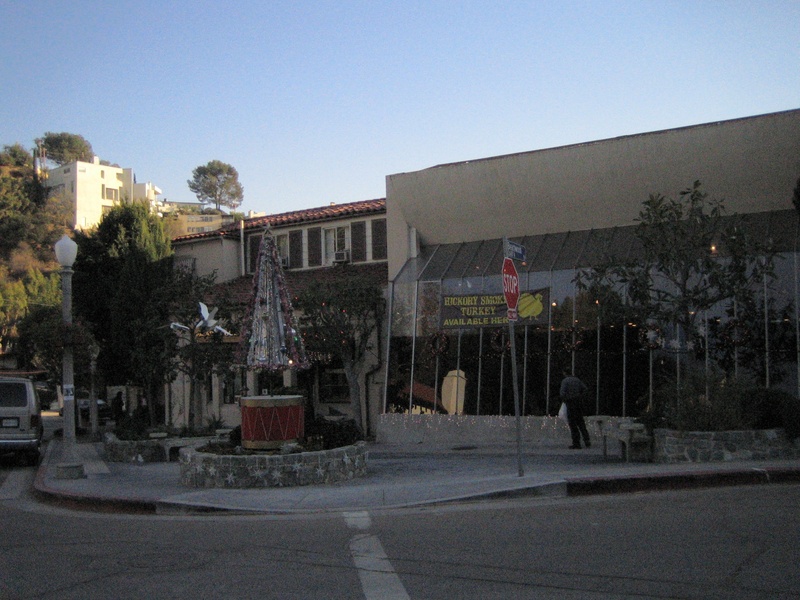 Beachwood Market’s Lautner addition, at right. Even by the fairytale standards set by Hollywoodland’s developers, Wolf’s Lair’s charm is exceptional. At once massive and delicate, it rises above Lake Hollywood like something out of a dream. I am grateful to Harry Williams for biographical information about Bud Wolf. 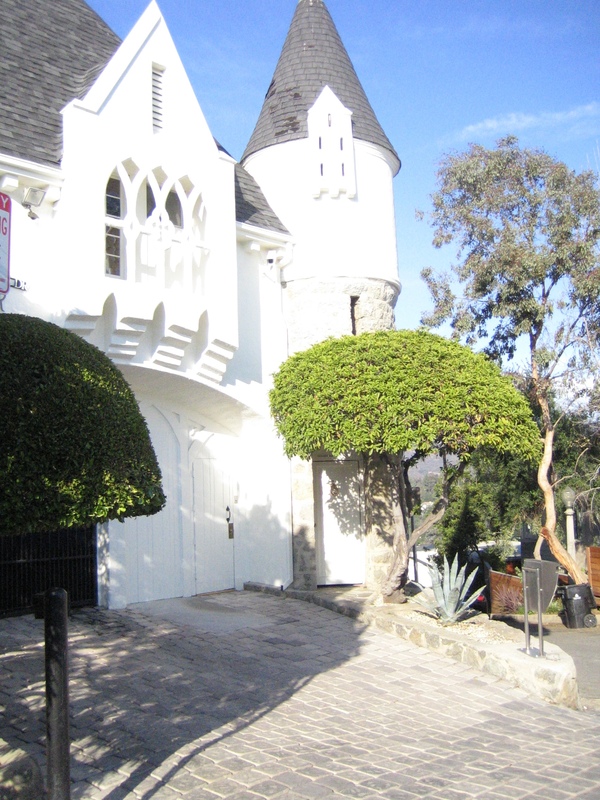 The Mulholland Highway mansion known popularly as the Madonna House is actually called Castillo del Lago, a name that aptly describes its imposing size and spectacular vistas of Lake Hollywood. Its 300-degree view also features Los Angeles, the ocean and–on clear days–Catalina. Designed by John De Lario for the oilman Patrick Longdon, Castillo del Lago has been a landmark since its completion in 1926. And though Los Angeles has grown ten-fold since its construction, the house remains a stately, solitary presence, all but invisible from the trail that runs alongside its massive retaining wall. 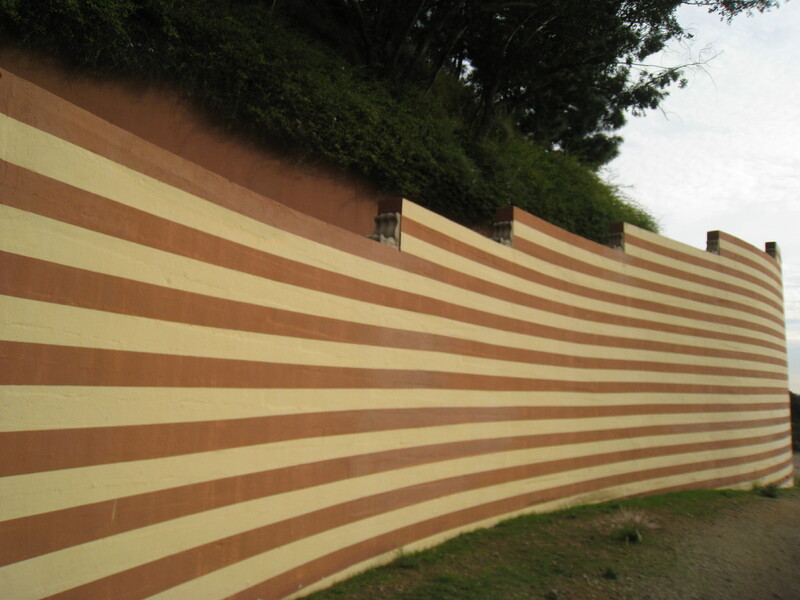 The wall, concealing a steep driveway, has itself become a landmark since Madonna, after buying the house for $5 million in 1993, had it painted with cream and crimson stripes, an act that apparently outraged the neighbors. (Christopher Ciccone, Madonna’s brother and former interior designer, says it was inspired by a church in Portofino.) Though now somewhat faded, it remains an arresting sight–if an ironic choice for a woman who complained the paparazzi were invading her privacy. Castillo del Lago’s most visible feature is its tower, a multi-story affair that rises out of the Torrey pines that shroud the rest of the villa. A magnificent spiral staircase and an elevator connect the various levels, which contain 9 bedrooms and 6 baths, as well as a library, game room, wine cellar and a lounge that resembles an Ottoman tent. There are offices, storage areas and servants’ quarters. Outside are formal gardens, fountains and a pool. At various times in its history, Castillo del Lago has been vacant, a white elephant during the Depression and beyond. Older adults who grew up in Beachwood tell stories of using it as a neighborhood clubhouse, entering through unlocked doors to play in the tower and on the stairs. Milt Entwistle, the younger brother of the actress Peg Entwistle, remembers that during the 1930’s the house had a modern stainless steel kitchen and walnut floors. As a boy he dreamed of buying the house, then priced at a stratospheric $20,000. In the late 1930’s, a newcomer to Beachwood leased the house: Benjamin “Bugsy” Siegel, the gangster best known for spearheading the post-war casino boom in Las Vegas. 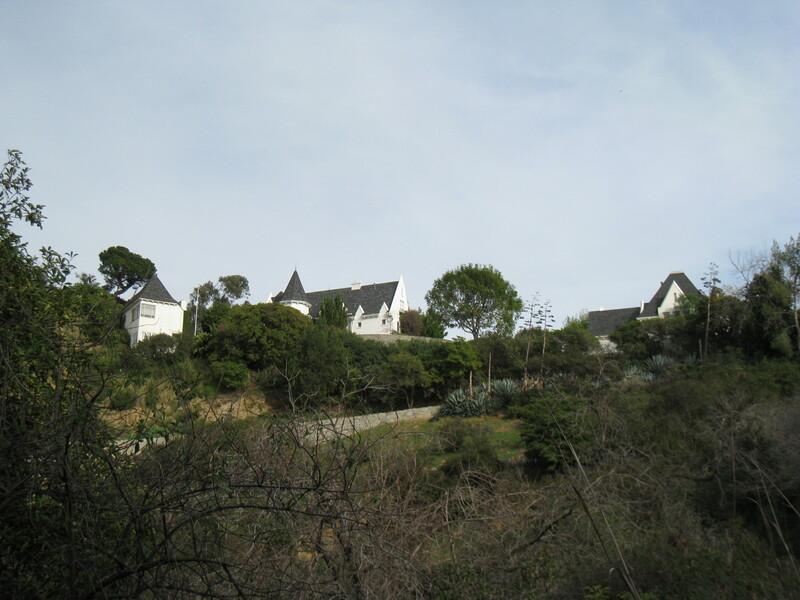 Though he later took up residence in Beverly Hills, Siegel apparently lived in Castillo del Lago for a time while running it as an illegal casino. (It was not a speakeasy, as many people have claimed, as Prohibition was repealed in 1933.) It’s not hard to imagine, given Siegel’s criminality and the extra-legal goings on within, that Castillo del Lago was the scene of some unsavory acts, including murder. Siegel moved on in the 1940’s, spending much of his time building the Flamingo Hotel and Casino in Las Vegas. As depicted in the movie “Bugsy,” he died in hail of gunfire in his Beverly Hills living room in 1947. (The hit was ordered by Lucky Luciano, whom Siegel fleeced to build the Flamingo.) Meanwhile, Castillo del Lago changed hands several times, going through at least one other period of vacancy in the 1950’s. When Madonna bought the place in the 1993, she undertook a renovation that cost $3 million and transformed the house from Spanish Colonial to Italianate. (The renovation still irks her neighbors, who claimed she “ruined” the house by painting the wall and replacing the original tiles with cheaper ones.) Perhaps because of the extensive renovation, the mood of the house lifted somewhat, though strange things still happened. According to Jacobson and Wanamaker, “Madonna confided to a friend that on occasion she felt a force throughout the house, a force that was not safe.” Her caretaker reported that doors closed and locked behind him whenever he stepped outside it. And when he was alone there at night, he could hear a man calling his name. In 1997, Madonna sold Castillo del Lago at a huge loss to Joe Pytka, the commercial director and restaurant owner (of Bastide, now defunct), who presumably gave any lingering ghosts the boot. (Disclosure: I was socially acquainted with Pytka in the early 1990’s, well before he bought the house.) Pytka, who bought the house for $5.3 million, listed it last year for $14.95 million after an extensive renovation of his own. (In addition to creating a new kitchen and master suite, he upgraded Madonna’s tilework.) Recently the price has been dropped to a relatively reasonable $9.99 million, so now’s the time to contact the agent (Benjamin Bacal/Keller Williams Realty Sunset) and make an offer. 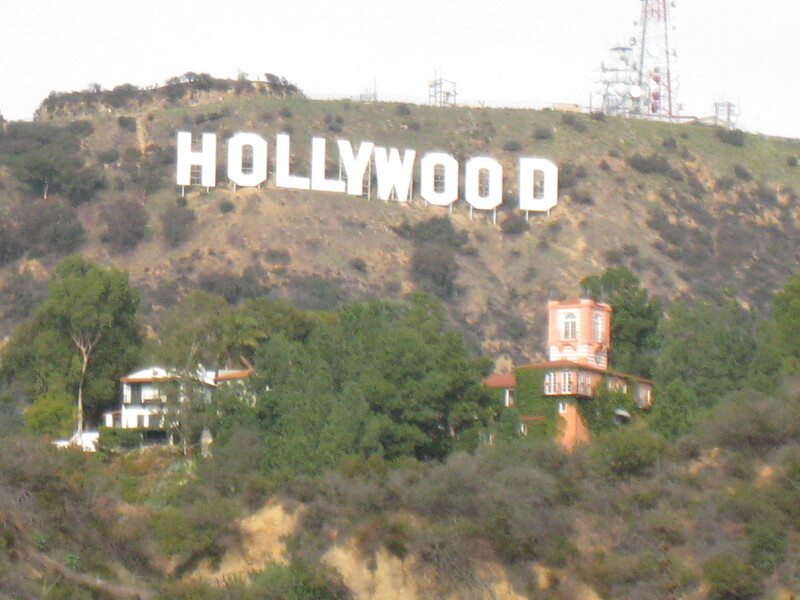 You are currently viewing the archives for January, 2010 at Under the Hollywood Sign.